Has Brexit killed your online friendships? An unexpected outcome from the EU referendum has been Frienxit. Frienxit is the sudden rise of ‘unfriending’ ‘unfollowing’ ‘muting’ or even ‘blocking’ people on social media sites, after people respond to alternative views. During the EU referendum debate, millions have taken to social networks to share their views like never before – but it seems not everyone wants to hear them. And now prior to the outcome on Britain possibly exiting the EU – many are exiting their digital relationships. It comes as people discover that their online friends, maybe are not the sort of people they’d like to spend time with – even if it’s only virtual time. But why now? Well when many of us first ventured onto social media there was great enthusiasm to connect with people we know. These are people we may not have stayed friends with in the real world. This has also been a very different debate from normal elections. People are not hiding behind party banners but ‘coming out of the closet’ on some of their more extreme political views. Maybe because of fear of the online abuse we have seen politicians face, many are choosing to Frienxit these relationships as an easier option to tackling these views head on. EUref result) – have you been Frienxited? The most frequent reason I am given on why professionals do not use social media is ‘I don’t have time’. By contrast despite incredibly busy live the likes of Sir Richard Branson, Stephen Fry, Ellen DeGeneres, Lady GaGa, Katy Perry, Scott Monty from Ford, Ralph Lauren, many senior politicians including President Obama and other notable ‘busy’ people can find time to fill 140 characters or more and post to social profiles. Admitidly some have assistants that help them, tmany of the names I have chosen directly post regularly themselves and have identified the benefits that social media can bring. So how can they find time when you cannot? Why have they made it a priority? Why do they think it is a worthwhile part of their daily routine – whilst you do not? People may not be interested in what you had for breakfast, though the occasional post that shows you are a real rounded human being can do no harm. Social networks are not just about one thing and people are interested by a wide variety of things. The great thing about social media is the audience decides if it is interested or not, and you will soon see what engages people – so do not pre-judge what they will or won’t like..
Social media is now an extension of how we interact as human beings both in private and in the work place. If you do not see the point then you are effectively saying you are not interested in those who use social media both within your current circle of influence, and beyond through the ripple effect and wider realm of influence social media provides. I totally understand people being cautious. However often people who tell me ‘they might say something wrong’ are professionals at the top of their game, who fully know understand what they can and cannot say as either a politician or business person in the public domain. After all they filter what they say everyday. A brief Google search will bring back nightmare examples of people doing stupid things on social media – but they are exactly that – stupid – and you should trust yourself to be able to make the right decisions about what you post. The fact you are concerned means you are less likely to post something you shouldn’t, and if you can’t be trusted it’s not just social media you should be worried about. Yes you might be attacked. But does it really matter? I remember when I first posted some tech tip videos there were several nasty comments include one saying that I had funny eyebrows. Would have prefered that he had said something about the video to help me improve my presenting style, and was interesting he himself had an unique style of hair growth above his eyes – but it did not really matter and was nothing more than name calling in the playground. There are tools you can use to mute out some of the unconstructive comments, however the biggest challenge I have found is to get people to engage at all. Maybe they are not saying anything as they are worried too. The biggest barrier to your effective use of social media is you and sometimes something as simple as your first post. If you are worried you may something wrong then say nothing at all and share something you find interesting which comes from someone else. Over time as you get to understand the community that you will become part of you will learn the unspoken rules which are mostly common sense. Social media offers so many opportunities. I have learnt however for those who have multiple reasons for not taking part, and as you answer these concerns come up with even more, until they are willing to try it nothing I can say will change their mind. But until that time please admit the real reason you are not on social media – is you. I remember being on holiday, sitting in the sun with a lovely chilled glass of wine, when I saw a friends update with a picture of him having fun at a party. For a moment I felt gutted, wished I was home in rainy Britain and able to be at the party too. When I returned from holiday I asked how the it was, and contray to the image painted by the photo was told the party was rubbish and really boring. Now whenever I look at Facebook updates I remind myself of this. More important than ever to do this as people are getting even better at creating this illusion of a world where every moment is fun filled and and amazing. Moments of time are carefully crafted and staged to give the best image. With studies linking use of social media sites with depression we all need to put other peoples digital updates into context, realise these are effectively personal press releases designed to show us as they want to be seen. In one survey they found 20% confessed to not being trueful about their holiday activities or jobs. 25% of Facebook users said they had falsfied some of the account information. I don’t think social media is making us more dishonest, it is just recording and sharing these lies to a much wider audience. This short film is a brillant portrayal of a very modern problem. Why are so many getting social media marketing wrong? 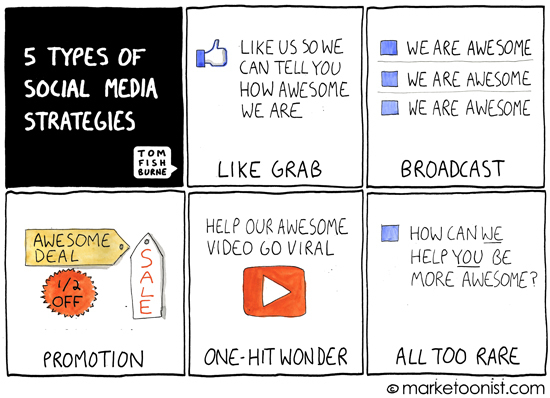 This comic succinctly captures what is so wrong with so many organisations social media activity. You need to spend less time talking about yourself on social networks and work harder for the attention you desire by providing real value to the communities you wish to connect with. Competitions and ‘viral videos’ will drive short term relationships where providing regular useful content can help build a valuable relationship. When you do talk about your products or services you need to start with how this will benefit your followers not how brilliant you are for bringing it to them. Slip back into old ways and no matter how much trust you have built up – you could quickly find yourself dumped as your followers will quickly go elsewhere. The helpful guys at Twitter have issued some guidelines and stats to help you get the most out of your tweets. Whilst the focus is on promoting mobile apps these lessons will apply whatever you are tweeting.